So you, dear reader, are a reporter (Boo! Hiss!) and you’re interviewing the leader of Church Universal, which has been created by the One World Government to bring all religions together as one. What would you ask His Excellency Howard Alphonse Bliss? Truth Publications feature writers Darek and Jillian Field and religion writer Ty Cole are in Jerusalem to interview Bliss, who proves a slippery subject when questioned on matters of theology. Chettri bowed. “Yes, your Excellence,” and left the room. “Well, this must be quite an assignment for me to get three of the world’s foremost reporters,” Bliss remarked, sitting down in one of a circle of overstuffed leather chairs. Ty lowered himself into in a wide leather chair and Jillian took a seat with Darek in a leather love seat. Jillian was impressed that Bliss did not take the place of authority behind his desk. She measured the man before them. Taller than Darek by about two inches—probably six-foot-two. Narrow-shouldered. Definitely not athletic. Piercing blue eyes. A narrow mouth with thin lips. Oozing with confidence. “Fine. What can I tell you?” Bliss asked. “Fire away.” He sat back, looking comfortable and at ease. A snake in lamb’s clothing. Bliss ran his fingers through his blond locks, then interlocked them in front of him, alternately raising his fingers (the old church steeple game, Jillian thought) and curling them. “Centuries of disharmony,” Bliss said. “Millennia, actually. Enough is enough. A major barrier between religions is that each has thought, ‘I’m right. Everyone else is wrong.’ This is an old trick of Satan that we first read about in the Garden of Eden. And killing each other in the name of God and ‘what we think is right’ is absurd. I’m sure God would have none of it. “How do you marry that concept with the Allah of the Muslims ordering the destruction of people of all other religions unless they relent and worship him?” Jillian asked. “The Muslim might answer ‘yes’ with their lips while firing a bullet into a Jew with the rifle in their hand,” Darek said. That’s my man. Straight and to the point. Just then the door opened and a dark-skinned woman entered, carrying a tray complete with tea kettle, coffee carafe, and a plate of biscuits. Behind her, a blonde, blue-eyed Norwegian-looking young lady came in, carrying a tray with cups and saucers, cream and sugar. Jillian was startled by their stunning beauty. Setting down the trays, the two women poured what the four people requested. “Thank you, Owandu, Kari,” Bliss said as they finished. Settling back with cup and saucer in hand, he turned toward Darek. “You mentioned the simplicity of our cause in these complex times, Darek. May I call you ‘Darek’? “Like who?” Jillian asked, edging forward in the love seat, wondering if his response would confirm what she knew to be true. Bliss did not lie. “From February through April 1996,” he said, “Episcopal Bishop William Swing traveled through Europe, India and the Middle East, hoping for a Church United—a sort of United Nations of Religion. He sought commitment from such leaders as the Dalai Lama, Islam’s Grand Mufti in Cairo, the Sankaracharya of Kancheepuram, Mother Theresa, and the Archbishop of Canterbury. He also sought pledges from people active in interfaith work, including those at a conference at the International Interfaith Centre in Oxford. In July and August 1996, the bishop visited with religious leaders in Japan and Korea. “In the end, he enlisted the commitment of many of the world’s religions, and that of Mother Theresa.” Bliss looked triumphant, his chest swelling. “Amazing,” was all Jillian could whisper. “Do you have records of this trip?” Ty asked. “Yes, your Excellence,” came the reply. Bliss turned to Jillian, Darek and Ty and, looking each in the eye, continued, “In keeping with your question, Darek, the same God who made the hands of a Jew, made the feet of a Christian, the eyes of a Hindu, the heart of a Muslim, and the brain of a Buddhist. Bliss’s piercing blue eyes zeroed in on Ty. “We have to love each other as brothers in God the Creator. You and I. Jews and Muslims. Christians and Hindus. Yes, and Mormons and Jehovah’s Witnesses who, I’m sure you think, are cultists. “How on earth, Mr. Bliss, can you have a religion, Church Universal, without a specific theology?” Jillian asked. “My answer, Jillian, is that I do have a personal theology that guides my own life. But Church Universal is just that: universal. We can’t take sides and nit-pick about the particulars, or the semantics, of any single religion. Because of that, though I may have a personal belief on all sorts of topics, I won’t get involved in debates on any of them. Jillian slumped back in the loveseat. Slippery as slime. This guy could have been a politician of the highest order. “Please do,” Bliss said. He crossed his legs, at ease. “You have the support of the One World Government and Sardis. How much do you intend to get involved in government affairs?” Darek asked. “What of Paul’s admonition: ‘A good soldier does not get involved in civilian affairs’?” Ty asked. “Obviously, I disagree,” Bliss replied flatly. “What are some of the specifics you refer to when you mention ‘helping to shape spiritual, economic, political and social dimensions’?” Jillian asked. “So, at this point you have no specifics?” Jillian pushed. “A whole lot better off, some would say,” Jillian responded. “Without America going to war, Hitler would have conquered the world and then you’d have no chance to compromise,” Jillian countered. Bliss waved off her answer. “You may argue anecdotally, but compromise is the only answer to the great challenges facing mankind and Mother Earth today. Premier Sardis is a master of compromise; he has to be. I believe I’ve displayed that I’m also adept at conciliation. Working together, we’ll show the world what truly great leadership is. “Premier Sardis and the One World Government leadership have relentlessly distanced themselves from prejudice, intolerance, discrimination, oppression and hate.” A pained expression filled Bliss’s face and he continued, “Those are five fruits that the world has, too often, witnessed in connection with the various long-time religions. Church Universal has and will continue to distance itself from these characteristics as well. These are fruits of bad religion and bad religious people. With that, Bliss thumped his clenched fist on the glass coffee table before him. “Cloning. Cloning has come a long way in the last couple decades, but no man has, or can, create a human being—or even one small part of a human being—from scratch. Jillian and the others waited for him to explain. After several moments, clearly no explanation was coming. Bliss’s face, for the first time, noticeably reddened. His nostrils flared. An eyebrow jerked skyward. Jillian wondered if he would reach across and slap her and envisioned Darek breaking his arm. But, no, he remained seated and drew in a deep breath. There was a deathly silence. Jillian, Darek and Ty took a collective breath, Jillian wondering about the answer and knowing they would be ushered out of the office when Bliss was finished with this question. Sidestep number one, Jillian thought. “The long answer is that these people should be looking forward to the coming of the Messiah, not trying to dredge up some sort of Antichrist or False Prophet. I, like these Christians, am looking forward to the coming of the Messiah. But I believe his coming is being hindered by such people as this. New Age, anyone? Jillian shook her head. Bliss noticed her response and raised the middle three fingers on his right hand. “I believe there are three types of people on earth: Those whose consciousness has been properly raised so they can readily accept the Messiah; those whose consciousness has been raised somewhat but not so high that they can readily and immediately accept him, but they might be able to accept him after further enlightenment; and those who will never accept him. These Christians, speak as they might about Jesus being their Savior, are deaf and dumb to what he said and stood for while living among us. He spoke of love, forgiveness, sanctification, and accountability. “As for me, I’m at peace with who I am. And that is not the False Prophet, but the leader of a great movement to reconcile men—” he eyed Jillian, “and women to each other. And if you want proof of the goodness of Premier Sardis and myself, simply check with Owandu if you see her on your way out. With that, Bliss stood. The redness began to retreat from his face, his blue eyes sparkled, smile lines wrinkled alongside his eyes, and his right hand shot out to offer firm handshakes to his three visitors. Have at it, dear reader. I’ve determined that the most important meal of the day is … the Word. Second most important meal? Coffee. Tice stood at the riverbank, spring runoff flowing swiftly past him. Certain death lay ahead. Certain torture lay behind. First, he couldn’t swim. And torture? That’s what they did with slaves who tried to escape. Struggling to catch his breath, he thought, Lord, how’d Your boy get here? What on earth I done? Homeschoolers need a good dose of history to pass Department of Education requirements, but where on earth can they find exciting, informative books that fulfill those guidelines and are told from a Christian perspective? Chosen by Publishers Weekly as a Featured Book for its Booklife magazine, True North: Tice’s Story carries readers along with 19-year-old slave Tice on his frightful flight to freedom. Pursued by his plantation’s menacing foreman, Morgan, who possesses an unnatural hatred of him, Tice is scurried along by courageous real-life heroes of the Underground Railroad in 1860. Christian and Jewish families, even Henry David Thoreau, help Tice whom they find likeable, friendly and even funny despite his life of misery and who wears his love of God on his sleeve. Indeed, on a late-night ride with Thoreau the 19-year-old Tice carries the day in an entertaining talk about God with the venerable author. Written for middle-schoolers and adults, True North: Tice’s Story is one of three Christian historical novels I’ve written that homeschoolers have embraced. The others are The Crossing, the previously veiled story of the Ku Klux Klan in Maine in the 1920s; and Midnight Rider for the Morningstar, the story of Francis Asbury, America’s first circuit-riding preacher, who sailed to America in 1771 and escaped ravenous wolves, deadly Indians, and dangerous highwaymen to carry the Word of God to the colonies and beyond. All are available on amazon.com. We probably all think about who we most want to meet in person, invite to dinner, delve the depths of religion, society, politics. But what about fictional characters? The question occurred to me while watching the Woody Allen movie, Midnight in Paris, in which the lead character is taken back in time and meets Ernest Hemingway, F. Scott and Zelda Fitzgerald, Gertrude Stein, T.S. Eliot, Cole Porter and Pablo Picasso among others — all living in Paris at that time. So-o, which fictional characters would you find most intriguing to meet? Here’s a challenge: Think it through and then write a scene with your characters — perhaps around the table that night, then around the billiard table afterward dinner. Or choose another place. Charles Dickens’s Scrooge. (Here’s a guy whose entire life, demeanor, and future turned on one night’s experience kind of like what happens to people when they’re saved by Christ. George MacDonald’s elderly cobbler who shares Christ with people who walk by his shop and, by the way, sets the young vicar theologically straight. Dantes, sitting with the dainty Miss Woodhouse, stiffened at Long John’s aggressive reproach, ready to protect his young companion if some clash should occur. Coffee mug in hand, Jack Reacher eyed the sword sheathed at Falstaff’s side and wondered about the make of steel. Was it German, or Swiss, or British? Did it have nicks from carving up adversaries? Had it done battle at all? He gauged that it was thirty-eight inches long, about the length of his own arms, and weighed a hefty three pounds. Maybe three-and-a-half. He’d hefted a claymore once and it was a good four or five pounds. Not a weapon for the weak. Whatever the weight, it would be easy enough to step inside a parry. If need be. A thumb to the fat man’s eye, another to his solar plexus and he’d be disabled in, say, eight-tenths of a second. Perhaps six-tenths. If need be, that is. If this Falstaff fellow pursued the issue. If he didn’t see his folly. It was then that Scrooge entered the bar. Good ole Scrooge, God bless him, his dark past forgotten, his new demeanor bright as the sun, his pocketbook as open as his heart; Scrooge, his hat in hand, shrugging off his overcoat and hanging it by the door; Scrooge, the man once despised by all but now adored like a kindly and kingly legend; yes, ole Scrooge the peacekeeper who, if one person owed another and a brawl was about to begin over the coinage, be it a crown or half-pence, would pay the lapsed amount to avoid a scrap; Scrooge who, in fact, had just dropped shiny pounds sterling into the pockets of Tom Sawyer and Huckleberry Finn, who were whitewashing the front of the building. At the transformed man’s entrance was the moment transformed, its tension distilled. He waved a hand behind him. Through the door came the prettiest young lady this side of Turnbury. Not flashy but stunning, not prideful but self-confident, Kat Cardova was, yes, in the house. Reacher gulped at her beauty. He’d seen her picture on magazine covers, but justice had not been done. And he was all about justice. Always. Justice and Reacher were tight friends. Long John drained another shot. He would have forgotten his name if asked. Beauty sometimes affected him thus — be it a full chest of bounty or a finely crafted lady. Your turn! And please do send it to me. The best scene (as chosen by a jury of one: me) gets a free, signed copy of True North: Tice’s Story, my tale about a young slave who escapes from Kentucky along the Underground Railroad, chased by a dastardly man who would be right at home on Long John Silver’s ship. Author markalanlesliePosted on January 15, 2019 1 Comment on Who Would You Invite? We’ve owned some brilliant dogs in our time, the smartest being Jamie (half border collie, half golden retriever). Close behind were purebred border collies Tess, Kate and Yancey and now border collie-Aussie Micah. Micah is the least intelligent among this group — although he would strenuously argue the point — and yet he is the scribe, the one who chooses to write the scenes involving Tuck, the doggie star in my Thrill of the Hunt Series. Tuck is the best pal and protector of Dr. Kat Cardova, our Yale University archaeologist. So it was only natural that when I introduced the character Tuck into Chasing the Music, my first Thrill of the Hunt book, that Micah insisted on writing the Tuck scenes. Micah has no problem commandeering my chair — any chair, for that matter — and since he knows better how dogs think, hey, rock ‘n roll, bud. Near the end of Chasing the Music it’s Kat’s birthday. Still in Israel, Max has a surprise. “What are you doing?” Kat asked. Max pressed SPEAKER and handed her the phone, certain she had no clue who was on the end of the line. Her answer came quickly with three barks. Max smiled back at her, glad to read the delight in her face. “I can hear it,” Max said, trying to suppress a chuckle. Max wiped the smile from his face. Another growl, followed by two barks. “I can see him wagging his tail,” Kat said to Max. Wearing plastic gloves from the reception desk, Max began leafing through the Hadith Qudsi’. A short, low woof broke Max’s concentration and he looked to the source. Three feet from him stood a handsome, almost regal, black-and-white border collie. The dog barked again, a low-decibel statement. Max cocked his head. The dog cocked his head. Max extended his hand. The dog retreated a step and woofed again, then turned to leave. He took a step, looked back over his shoulder, and woofed a little louder, a bit higher-pitched, adding urgency. Or exaggeration? Border collies, after all, were no-nonsense, used to being in charge. Max grinned. He lifted the book from the nook and followed the dog, who was moving along at a good clip—purpose in his step. A few yards along, the dog again looked over his shoulder, as if he were making sure Max was tailing along. Max could have sworn he read a smile on his muzzle. A right turn, a left turn, and they approached a woman seated in a corner nook. The dog turned and sidled up to the woman [Kat], his shoulder touching her leg. That’s kind of how Micah feels about himself. Oh, and that phrase “used to being in charge”? Micah is every bit that. I left Tuck out of Operation Jeremiah’s Jar, the third Thrill of the Hunt book, which again takes place in Israel. Micah’s reaction? With China closing down churches and rounding up Christians by the thousands; Sudanese Arabs terrorizing Christians; Syria attacking its own people with chemical weapons — with all of this happening, the UN chose to respond as usual — by reprimanding Israel for responding to a barrage of bombs from Gaza into Jewish communities. Anti-Semitism is on the rise everywhere — not just the Arab Middle East. And the overwhelming vote against Israel, with many countries abstaining, proves the point. Well, The Last Aliyah begins with the United Nations approving Resolution No. 2019-666 which bans Jewish immigration into Israel. No more Jews are allowed to leave America, France, anywhere and move to the Jewish homeland. The reasoning: because Arabs are allowed to vote in Israel and because of their explosive birth rate, they can eventually take control of the land by sheer population growth — a takeover speeded up if Jewish immigration is outlawed. In the middle of the night before leaving Washington, DC, for summer vacation, the U.S. Senate bows to the anti-Semitic President’s will — and arm-twisting and political promises — and approves the Resolution. Voila! A modern-day underground railroad rushes to help Jews escape America — either to emigrate directly to Israel or get to a country (Canada) that has not approved the Resolution. Here’s the first scene of The Last Aliyah, written during President Barack Obama’s administration when such a scenario seemed more plausible. But, truly, could this happen today? Or under another President’s administration? Anti-Semitism is not only growing in Europe and England but here in America. The call that changed Nobel laureate Omri Zohn’s life came at that hour whenthe most distasteful acts are perpetrated in Washington, D.C.—when Congressmen can board flights home before the news hits the airwaves. Omri forced one eye open and squinted to see the phone’s caller ID. 202 area code. His friend, U.S. Senator Joseph Frank. His heart fluttered, or maybe even skipped a beat and he tried to calm a shaking hand as he reached for the phone. “Omri! It’s Joseph.” The voice boiled with tension, urgency. Zohn sat up in his bed and struggled to open the other eye. He looked at his clock: 2:58 a.m.
A crushing weight settled on his chest. “Oh, my Lord,” rushed in a hushed tone through his lips—more a moan than a statement. Omri flicked on the light of his nightstand and swung his legs off the bed. If the sky was falling, he had to move, get his plans in motion. 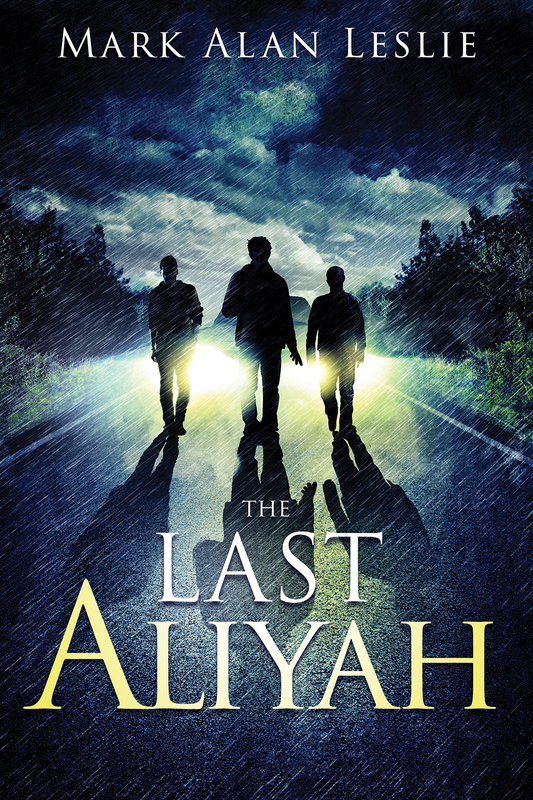 You can grab a copy of The Last Aliyah through Amazon.com, elklakepublishinginc.com, barnesandnoble.com, or me personally. A Christmas present for a friend or yourself? Sure! Thanks for your support, everyone who answered my request for their favorite “as-yet-Unknown author” by naming me. But I think I’d like to mention three other nominees in particular: Charles Martin, Lynn Austin and Assaf Gavron. I must say, I love y’all’s taste. AFA Journal Editor Randall Murphree, renowned for his insights into novels as well as news, suggested Martin, who has written The Dead Don’t Dance, Wrapped in Rain and When Crickets Cry among others. And with When Crickets Cry under my belt, I anticipate reading the others. “I wish every fiction lover could discover Charles Martin,” Randall wrote and he made sure I did by mailing me his own copy of When Crickets Cry. Writing When Crickets Cry in first-person point of view, Martin drills deep into the psyche of his protagonist and other characters and you feel what they feel — deeply. Their aspirations are yours, their challenges yours, their desperation yours. One distinction of a good book is when you hope its characters return in a sequel. It’s apparently not happening here, but I expect Charles Martin meets, even exceeds, expectations in other offerings. Jewish Jewels cofounder and president Neil Lash recommended Austin, whose historical biblical novels are “great writing and give real insights into the Bible and the people who are in it, like Isaiah and the kings of Israel,” Neil said. After that will come Austin’s On This Foundation, following Nehemiah, the cupbearer to Persian king Artaxerxes who gives him permission to lead a rebuilding of Jerusalem’s wall — never anticipating all the dangers that await him on his arrival. MaryAnn Gilbert’s choice of well-known Israeli author (but who’s heard of him in America?) Assaf Gavron is intriguing. Gavron’s The Hilltop, translated into English by Steven Cohen, is celebrated in Israel. It is a deeply true but fictional story of a hilltop settlement in the West Bank, otherwise known as Judea and Samaria. Gavron invites readers into the homes, lives and faith of Israeli settlers who create, inhabit and defend their settlements while attempting to live in peace with Arab neighbors and the politics of Israel. “We follow the reasoning and choices of those who stay, those who leave, visit elsewhere and return, and those who visit and leave for a place more suited to their comfort zone,” MaryAnn said. Please take my recommendation, folks, and visit the works of these three authors… and, by the way, investigate authors not on the bestseller lists, won’t you?